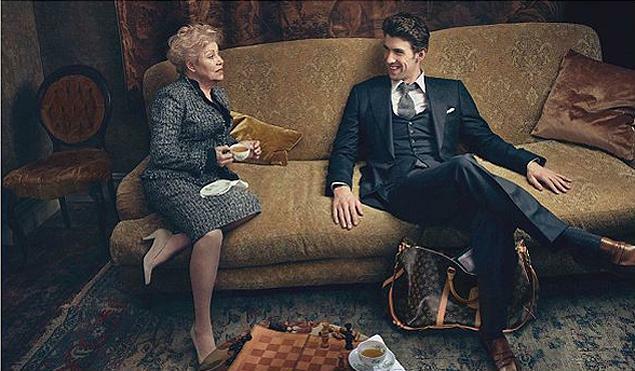 Fabulous Channel by Giselle Claudino: Michael Phelps Stars Louis Vuitton Hot Campaign! The Olympic swimmer Michael Phelps is making a big entrance in the fashion world. Right after done with the Olympic games in London, Phelps already got a new gig, and what a gig!! In this past few days, the most decorated Olympian of all time, was named the new face of Louis Vuitton’s new campaign (brand’s “Core Values”), and better than that, in some photos of the editorial he appears half naked, only wearing speedos and a pair of goggles inside a bath water. The campaign was shot by famous photographer Annie Leibovitz, which also captured moments of Phelps along with the second most decorated Olympian of all time, 77-year-old Larissa Latynina, former Soviet Gymnast. The 27- year -old athlete may have announced his retirement from the pool competitions, but it seems like he is just starting a new career. Will Michael Phelps pursuit modeling or not? While we can’t answer that question, we can share some other great news about Phelps. He will be appearing on Hank Haney's Golf Channel show, which will follow Phelps' try outs to improve his game under the guidance of big time Golfer Tiger Woods.